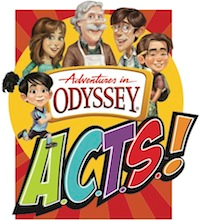 *This post is sponsored by Adventures in Odyssey. All opinions are my own. in making images themselves when they hear a good story. Their imaginations are enriched and stimulated, and the material becomes more personal and memorable. their imaginations to serve their family, community, and world this summer—maybe by sending a care package to a missionary or baking cookies for the local fire department. 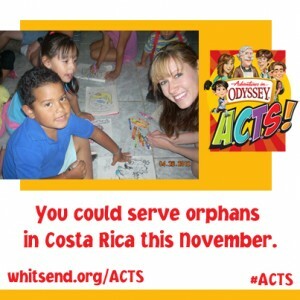 Check out www.whitsend.org/acts for details and a chance to win fabulous prizes, including a mission trip with a parent to Costa Rica! This summer, I wanted to let my children take the lead in deciding how we will serve others. We decided to take the A.C.T.S. Summer of Service Challenge and use our time to bless others. It was so fun to let them sit back and dream up ways to serve that not only would bless others, but that fit with their giftings and personalities. We will be constructing “Blessing Bags” for the homeless and those people who are standing on the street corners asking for help. So many people look the other way. Some even sneer. My daughter however, saw a woman standing on the corner with a sign, and asked what she was doing. When I explained that she was going through a hard time, and she was asking for help, my daughter’s heart began to show. “Mommy! Let’s help her. I want to give her some of my money.” She saw a need and wanted to meet it. To honor Hannah’s loving spirit, we will be putting together Ziploc bags full of things like bottles of water, granola bars, gloves, toothbrush, etc. to hand to those we pass by as we drive. My son’s idea was to serve at our church’s food pantry. Once a week, we open our doors and community members come and receive boxes of food. We have lots of people on hand to help carry food, etc. BUT, we also have those who are there just to visit or share a smile. I know my son’s infectious joy would brighten the day of anyone needing to make use of the food pantry. How will your family serve this summer? What creative ideas can you come up with? Use your imagination and let your love for others shine. Here’s a story of how one special boy served others. There are SO many creative ways to serve and show love to others. Using our unique talents and ideas can help us change the world in such an authentic and caring way. Let’s rally with our kids this summer and see how we can serve others. The possibilities are limitless, especially when we use our imaginations! 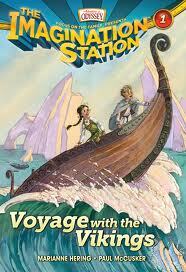 I have the privilege of giving away books #1-3 in the Imagination Station series! Travel through history with cousins Patrick and Beth. The key to adventure lies with your imagination. These books look absolutely incredible. Click HERE for more information. Thanks for entering and good luck! 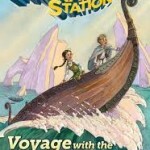 My girls absolutely LOVE Adventures in Odyssey! We are helping in vbs. Decoration time now! Also we help give food and clothes to our local missions and then whatever the vbs collection theme is. I always try to teach my kids to be givers not getters. We are helping in the nursery and cleaning up at the parks. Bringing meals to new moms! We help by raising money for the animal shelter and the food bank. We help out at our church throughout the summer. My family can help other by giving to local food bank and helping some older people with yard work. volunteering at Woodstock Farm Animal Sanctuary! Helping out at the local food bank or community garden are great summer time ways to help out. We don’t have a lot of money but we love to donate personal care supplies when we score freebies. Some of the food pantries like to stock toilet paper, toothbrushes, toothpaste, etc. My son and I help distribute rations at the local food bank during the summer! I cleaned out all of our closets and gave away our clothes and all the baby items that my one year old has out grown. We donate clothing to Goodwill. My son and I enjoy helping our neighbor with yard work every summer. We do what we can to help out. We give to those in need whenever we can. We serve others by giving vegetables from our garden to those in need. Make sure they stay cool.